Pictured above is a sign spotted in the window of a closing Borders store in Chicago. Apparently, the employee is bitter about its closing. 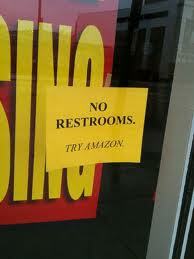 The sign certainly got a chuckle out of me considering that you can't use the restroom online. Last Saturday, I went to one of the four stores closing here in Michigan. I literally walked around in tears. When Borders says, "EVERYTHING MUST GO" it is not an exaggeration. Literally everything has a price tag. The cash registers, the coffee makers and equipment from the cafe, chairs, bookshelves, posters, music, books, fixtures, and even the refrigerator from the employee kitchen. This is so sad. Only positive thing was I scored a mini book haul and only spent $11. The stores are up to 70% off everything, so make a trip and support your local Borders for the last time. In addition to bouncing paychecks, Borders also neglected to pay the 401K for its employees. In positive Borders news, take advantage of the Educator Appreciation Days held April 8-12, 2011. Teachers, certified homeschoolers, school administrators, librarians and college instructors will receive a 30% discount on purchases during this timeframe. The discount applies to all eReaders and is available at Borders stores scheduled to stay open for business. That sign is hilarious to me! Probably because I work at a Borders that will be closing in about a month and when we found out we couldn't wait to close the bathrooms! But I'm not looking forward to the very last days. I've worked with some incredible people for the last decade and had a lot of fun. Toni, I didn't know you worked at a Borders! I'm sure the mood there is very solemn and bittersweet. What is the final closing date? "FYI: The New York Stock Exchange removed Borders." All of the Borders stores closest to me are closing (even the huge one that I would drive 30 minutes just to pay a visit) and every time I pass by their "EVERYTHING MUST GO" sign, I feel this pang of guilt. That sign in the window is pretty funny though. But again...guilt. Amazon brings out my inner penny pincher. My heart goes out to the employees, though (Toni, I've never met ya, but that includes you, too). I was under the impression that Borders would be offering work relocation or help finding alternate employment, but that's probably a bit of a pipe dream. Luckily, my local Borders is staying open...for now. Although the biggest store where the authors hold book signings in closing. I fear this will have an effect on book tours for bestsellers. I feel the same pang every time I pass a sign.